Every year, 1 in 100 babies is born with Congenital Heart Disease, the number one killer in the first year of life. CHD, among the most common birth defects, is an abnormal development of the heart and constitutes the leading cause of death, if left untreated. At least 35 types of defects are recognized, ranging from simple to complex malformations. The term congenital does not necessarily indicate that there is a hereditary reason for this abnormal development. The causes of most congenital heart defects are still unknown. 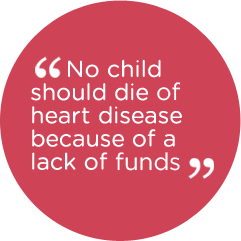 Congenital Heart Disease can affect any child, regardless of nationality or socio-economic background. In Lebanon alone, more than 700 babies are diagnosed with heart disease every year. About 400 of these children will need some form of treatment, either surgical intervention or non-surgical procedures such as catheter-based therapy, coils, stents, and implantable devices. With appropriate resources and treatment options, 97% of children born with CHD can be saved and will go on to lead healthy lives.